An infographic released by Fairmont.com shows the world’s greatest outdoor ice rinks, and Canada easily dominates the list. 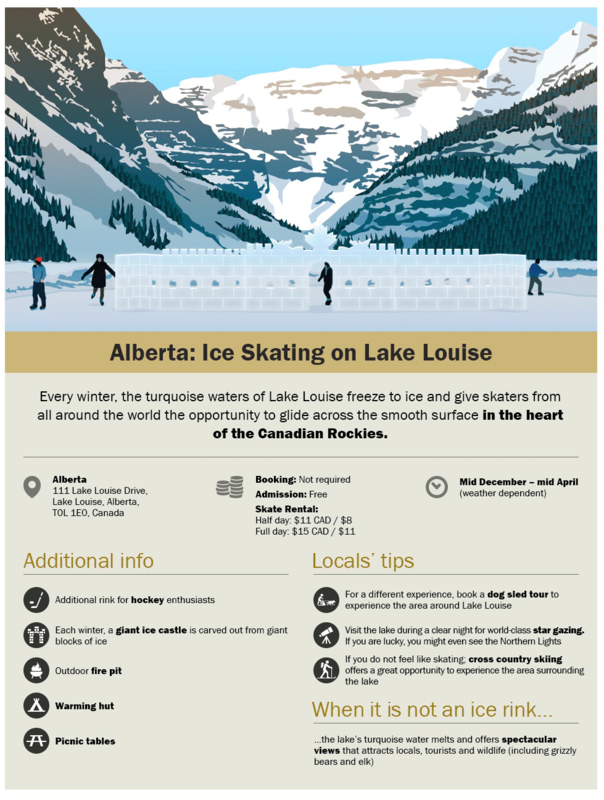 The illustrated graphic, which doesn’t specify a ranking among the ten listed rinks, includes Ottawa’s Rideau Canal, Toronto’s Nathan Phillips Square, Vancouver’s Grouse Mountain Skating Pond, and skating on Lake Louise. International cities listed include New York’s Wollman Rink and London’s Somerset House Ice Rink. The guide provides detailed information on each rink, from opening times to pricing. For those who love to ice skate, these are all worth a trip.